What about cloud computing and clots? However, once the first bank became a victim, immediately all the other institutions started to learn more about the attacks, search for solutions, then deploy those solutions quickly. When I look at military cloud security solutions, there are many vendors and partners providing tools and solutions, but not many providing availability security embedded computer attacks are hurting the availability of online services and many antivirus vendors and firewall vendors do not focus on the availability aspect.” Cloud providers find protecting the shared infrastructure can be challenging because it is an expensive up-front cost, he continues. For C4ISR systems, ready access to and sharing of visual information at any operator position can increase situational awareness and mission effectiveness. Operators utilize multiple information sources including computers and camera feeds, as well as high-fidelity radar and sonar imagery. Deterministic real-time interaction with remote computers and sensors is required to shorten decision loops and enable rapid actions. A new All-in-One Gaming Board, the AMB-A55EG1. AMB-A55EG1 features AMD Embedded G-Series T56N 1.65GHz dual-core APU, two DDR3-1333 SO-DIMM, which provides great computing and graphic performance is suitable for casino gaming and amusement applications. It is designed to comply with the most gaming regulations including GLI, BMM, and Comma 6A. AMB-A55EG1 is specifically designed to be a cost competitive solution for the entry-level gaming market. AMB-A55EG1 utilizes the functions of an X86 platform, 72-pin Gaming I/O interface, intrusion detection and also various security options, and a complete line of Application Programming Interfaces to create smoother gaming development. acrosser AMB-A55EG1 is powered by AMD low power G-Series T56N dual core platform that uses an AMD Radeon HD 6320 graphic controller. The DirectX® 11 support lets you enjoy awesome graphics performance, stunning 3D visual effects and dynamic interactivity. Discrete-level GPU with OpenGL 4.0 and OpenCL™ 1.1 support device provides the tools to build the designs of tomorrow, today. In conclusion, AMB-A55EG1 bridges Acrosser’s innovated gaming solutions and AMD Embedded G-Series APU to bring the optimum combination of computing power, graphic performance, and gaming features. Acrosser supports all gaming products in Windows XP Pro, XP embedded and mainstream Linux operation system with complete software development kit (SDK). In addition, Acrosser’s gaming platforms have a minimum 5-year availability to fulfill the demand of long term supply in gaming industry. For the critical embedded computer industry, electronics reliability is not merely a desirable attribute – it’s a definite must-have. Consequently, VITA’s 51.0 and related reliability prediction standards, in addition to its Embedded Computer, aim to develop standards and guidelines to make reliability prediction more manageable. Computer reliability has been near the top of the list of concerns for system developers since the dawn of the computer. The level of reliability has increased multifold over the years, making embedded computer reliable enough for even the most critical applications. What about embedded mobile market? Mobile computing has always required a balance of embedded performance and power consumption. The combination of smaller form factors and consumers demanding more out of their devices has led chip designers to develop ways around the power/performance gap. Without cutting power altogether, designers turn to techniques like clock scaling, where embedded processor speeds vary based on the intensity of a task. Designers have also reverted to dual- and quad-core processors that decrease power while still delivering performance. As consumers continue to trend toward an “always on, always connected” experience, processors must become more powerful and more energy efficient. The way consumers use computing devices is drastically changing, as their primary computing devices are no longer stationary, but carried paltform around in their pockets, bags, and purses. The number of mobile connected devices will exceed the world’s population in 2012, according to industry studies. By 2016 there will be more than 10 billion mobile Internet connections around the world, with 8 billion of them being personal devices and 2 billion Machine-to-Machine (M2M) connections. 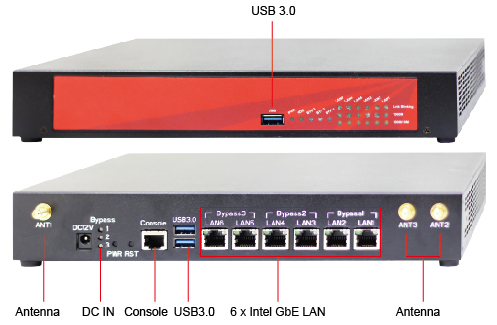 AR-B5630 is the most powerful embedded computer board that good for system integrator to fit application projects such game machine, POS/Kiosk, digital security, digital signage.., etc. With Intel® GME965 embedded high speed chipset and Intel® Core 2 Duo CPU support 533/667/800 MHz FSB (Front Side Bus) not only can handle complex multi-task processes and execute several application programs concurrently with admiring performance beyond customer’s used experiences. The AR-V6100FL fanless thermal design provides the high reliability in vehicle applications. 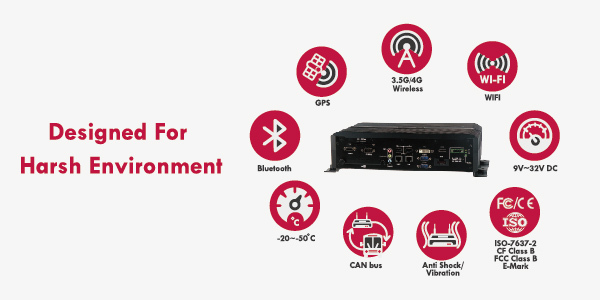 The AR-V6100FL utilize advanced heat pipe, heat sink, thermal pad to solve the problem of heat generated by CPU, Chipset, DRAM and power devices. This is a big challenge for designing a Fanless Computer which supports 45 Watts Quad Core Core i7 processor. All components used in AR-V6100FL are industrial proven and only solid state capacitors are utilized for high MTBF. acrosser also integrated two new useful features to the AR-V6100FL. The one-wire (i-Button) interface provides system integrators a low cost solution for driver ID, temperature and humidity sensors. The combo connector combines VGA, audio, USB and DC 12V power output all in one connector so significantly simplify the harness between the computer and Accrosser’s in vehicle touch monitors.